The "Millandes" lieu dit is bang in the middle of Morey a couple of hundred yards down the slope from Clos de la Roche. This premier cru from the 2012 vintage opens up on an attractive ripe raspberry and strawberry nose. Always a good sign! This ripeness reflects the fact that the harvest of these grapes took place in late September. There is good finesse, lovely length, beautiful fruit. But its not a fruit-dominated wine since there is good acidity, hints of spice and ripe tannins. 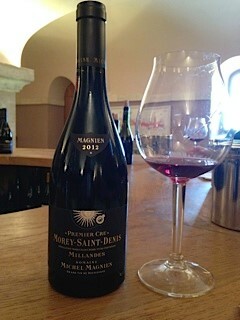 Aged in just 10% new oak this Morey shows all the characteristics of a splendid Burgundian pinot. Scores 24-26/30 for a Morey 1er Cru.